How can Brazil ensure that its World Cup infrastructure investments are sustainable? Photo via M.J. Ambriola. Recently we wrote about Brazil’s preparations for the 2014 World Cup and some of the proposed transport infrastructure improvements, including more than 500 kilometers of bus rapid transit (BRT) lines, that will come out of the R$11.48 billion (US$6.48 billion) already dedicated to World Cup “urban mobility” investments. Toni Lindau, director of the the Center for Sustainable Transport in Brazil (CTS-Brasil), which is a member of the EMBARQ Network (the producer of this blog) pointed out that all of these improvements are meant to be long-term, sustainable infrastructure investments. But how can Brazil ensure that these improvements happen in the most sustainable fashion possible, and generate the greatest possible benefit to society as a whole? This summer, Ernst & Young and the Getulio Vargas Foundation (FGV) set out to provide answers to such questions. In late June, the two organizations released a sixth installment of their Sustainable Brazil series, entitled “Social and Economic Impacts of the 2014 World Cup” (PDF). The study includes analysis of the socioeconomic impacts of the World Cup and how to make the World Cup “greener,” and it aims to identify ways in which Brazil can ensure that “the event lasts not only a few days, but many years, leaving a positive legacy for society as a whole.” It’s an issue that TheCityFix has explored before, when we considered the legacy of the Olympics. 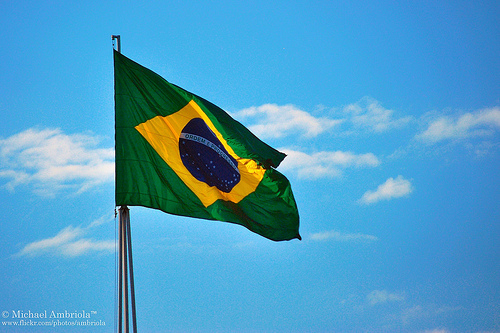 The recent Brazil study predicts that the country’s economy will “snowball,” growing by more than five times the R$22.46 billion (US$12.8 billion) spent by Brazil to ensure adequate infrastructure and organization. This means that in total, from 2010 to 2014, an additional R$142.39 billion (US$81.39 billion) will flow in Brazil, creating 3.63 million jobs per year, and R$63 billion (US$36 billion) in additional income for the population. So how can Brazil embrace the opportunities provided by this four-year period of massive investment and economic growth to provide greener transportation to more people? Since the 2006 Germany World Cup, FIFA has been developing its “Green Goal” program, aimed at making the World Cup greener with a focus on four sectors: water, waste, energy, and transport. Km of bike paths built. Number of bike path users. 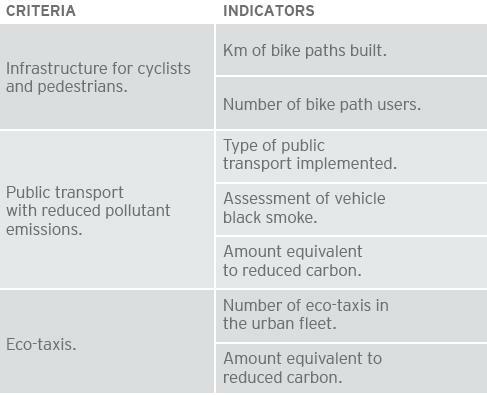 Criteria and indicators for the attainment of "energy efficiency, using universal accessible means of transport that minimize pollution." “Capitalizing on the legacy” of the World Cup is a challenge facing transport planners, according to the study. But the study also lists the successful completion of infrastructure projects — and the World Cup, in general — as the key measure of ensuring that World Cup legacies provide long-term benefits to society. For the successful completion of sustainable transport infrastructure projects, the study highlights the need to avoid historical reasons for inefficiency in Brazil, including the following: insufficient or incorrect budgets; readjustments due to errors or omissions in initial projects; readjustments due to poorly performed construction works; costs due to delays or disruptions in construction works (overtime, emergency bidding, rework due to deterioration); and costs due to changes in the macroeconomic, foreign exchange, or financial environment. All of these pitfalls — except perhaps the last — are easily avoidable, with proper planning, management and monitoring of transport infrastructure investment. The study indicates the importance of seizing this moment to make dramatic improvements in the country’s infrastructure. Brazil’s rate of growth could suffer in the coming years without significant investment in the transport sector, including urban mobility, and the World Cup is providing the opportunity to complete these projects in record time. “Multicultural cities” with modern, sustainable, multi-modal transit systems, we hope.